A budding marijuana plant within weeks of the harvest is seen at SLOgrown Genetics in the coastal mountain range of San Luis Obispo, California, Sept. 11, 2018. 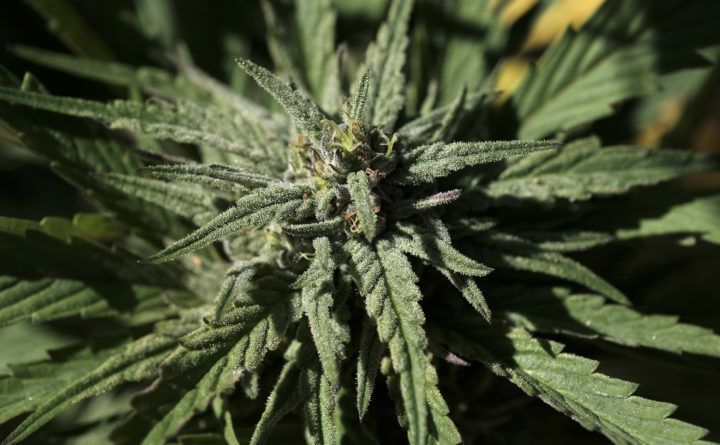 In deep-red North Dakota, on the other hand, voters overwhelmingly rejected an unusual bill that would have legalized marijuana without setting any possession limits or regulatory structure. The outcome in North Dakota underscores Republican skepticism of legalization — in the Gallup survey just 53 percent of Republicans nationwide said they supported marijuana legalization, compared with 71 percent of independent voters and 75 percent of Democrats. Elsewhere on the ballot Tuesday, voters in Missouri approved one out of three medical marijuana measures up for consideration, avoiding a potentially messy fight over which measure would go into law if multiple passed. Missouri’s Amendment 2 allows doctors to recommend marijuana for a number of medical conditions. Patients would be able to obtain the drug either through a dispensary or by growing it at home. Meanwhile, as of this writing, a medical marijuana measure in Utah is leading 54-46 with 56 percent of precincts reporting. That comes after supporters and opponents of the bill struck a deal with Utah’s governor to call a special section of the legislature to write a compromise bill regardless of whether the measure passed. Supporters of the bill agreed to the compromise because lawmakers in Utah are able to overturn ballot propositions with a simple majority vote.